High Quality Hardwood Presentation Box as shown, Included. Here we have a simply beautiful, fully restored Jaeger-LeCoultre gentleman’s automatic dress watch from 1956. As can be seen, this is an elegant, classic, understated timepiece. However, upon close examination, this watch is seriously impressive for the quality of its screw-back two-piece case and its absolutely beautiful dial. It also has one of the highest quality automatic movements made by JLC at the time and was on par with the very best available from any Swiss manufacturer. The simple, classic, understated and beautifully well-balanced dial is pure elegance and style. All in fact that Jaeger-LeCoultre represents. Gilt facetted arrowhead hour indices, matched by original restored Dauphine hands and the crosshair subsidiary seconds dial at 6 are all in the typical 1950s style. This is classic vintage dress watch dial design at its best, and something all contemporary watch dial designers try but fail to emulate. The Ivory Cream contrasts beautifully with the case and hands and looks much better than the photographs can convey. The dial is simply signed ~ Jaeger-LeCoultre and Automatic with Swiss at the very bottom of the dial. This is the original dial which has been restored to the highest possible standards by the best dial restorers in the UK. The 34mm, 18ct yellow gold watch case is noticeably heavy and of exceedingly high quality, being solidly constructed in two pieces with a heavy screw-down case-back. Due to the sophisticated case construction with multiple edges and elegant acute profile, the watch sits beautifully on the wrist and looks every bit the quality piece it is. The watch case is in immaculate condition with no scratches, dings or other signs of wear visible to the naked eye. The inside of the case is correctly stamped with the LeCoultre fir tree and also carries the correct Swiss 18ct Hallmarks. Externally the case carries the case serial number A703132. Although this watch may have been marketed as waterproof when new, and even though the rubber seals have been replaced, this has not been tested and it is not guaranteed. Jaeger-LeCoultre movements are amongst the highest quality and top tier of most highly regarded Swiss watch manufacturers. The movement used in this watch is the Jaeger LeCoultre calibre P812, introduced in 1956, which is a superb 17 jewel example of a classic ‘bumper’ automatic. A bumper self-winding movement is wound by means of an oscillating rotor that travels through a 180 degree arc, being arrested by buffer springs that then bounce the rotor back in its original direction. The bounce can just be felt if one rotates the watch slowly from side to side, but in normal use, one is seldom conscious of its ‘pulse’. Indeed it is quite an endearing character of the vintage watch. This is the original movement, which as can be seen, is in sparkling condition having just been fully overhauled and serviced by our Master Watchmaker. This involves complete disassembly of the entire watch movement, close inspection of all critical parts under high magnification and then replacement where necessary, using only original manufacturer parts. The following stage is lubrication using individually specified lubricants for differing parts of the movement and careful re-assembly before regulating / timing. The watch winds and sets smoothly and is currently keeping accurate time, consistently, to within 8 seconds per day! This is outstanding for any vintage watch of this age. We therefore we have no hesitation in offering this watch with our 12 months warranty*. This movement is signed ‘Jaeger-Le Coultre’ ‘‘Fab Suisse’ and P812. The movement number Serial Number is 1,161,856, also dating the watch to 1956. We have fitted a new, high quality Tan Ostrich strap with a rarely found, gold plated Jaeger-LeCoultre buckle. Please note if a different colour or style of strap is preferred, please let us know and we will do our best to oblige, free of charge. We carry tan, conker, dark brown burgundy and black straps in stock, in plain, padded leather, alligator, crocodile or lizard skin. However, if something different is preferred we will do our best to assist. Although there are no original papers with this watch, the reference numbers, markings and signatures are all correct, dating the watch to 1956. A detailed ‘Particulars’ document will be included in the sale, along with our detailed receipt and our 12 months’ Warranty*. A separate insurance valuation for the replacement value of this watch will also be provided at the time of sale along with our unique ‘Lifetime Authenticity Guarantee’ which states: “If this watch proves to be anything less than totally authentic, or not as described, Vintage Gold Watches of London will offer you a full refund at any time”. 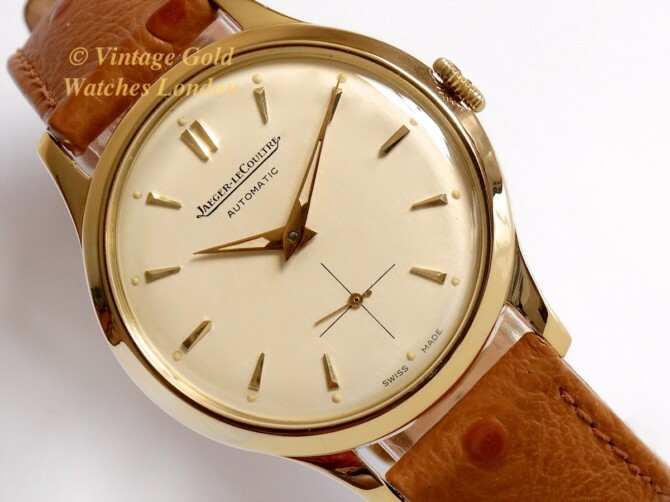 This is a simply wonderful vintage gold Jaeger-LeCoultre watch and having taken pride in its restoration, we are very proud to offer this here for sale in almost as new condition. It is many more times more stylish than a modern equivalent watch and even though it is over 60 years old, it is still completely fresh, reliable and practical to wear as your everyday watch, should you wish to do so. Most of all it is a thing of beauty – some might say a ‘work of art’ – from one of the most prestigious names in Swiss watch-making. However you may wish to view it, this timepiece will make an excellent investment and heirloom piece, as well as be something to treasure and enjoy. As each year goes by and the world market for vintage gold watches grows ever larger, the limited supply, allied to high demand, means prices will inevitably climb ever higher! A word on our prices – We always try our hardest to acquire the very highest quality watches we can find, before then restoring them to the highest possible standards. We then offer these at the fairest prices we can, taking into account our pre and post sales care and service. This approach means we will never be the cheapest, but nor will we be the most expensive. Indeed there are some well-known stores in West London which are highly successful, charging between two to three times the price you see here. We therefore consider our prices to be fair, given the quality of watches we have to offer. We are happy to accept PayPal as this is the quickest method of payment. However, if you would like to pay by UK cheque or by UK bank transfer we will be pleased to assist you with this and pass on a 3% saving to you. Similarly, if you wish to pay by International SWIFT or Bank Wire Transfer we will provide you our BIC / Swift number and our IBAN number. Please note we welcome part exchanges.